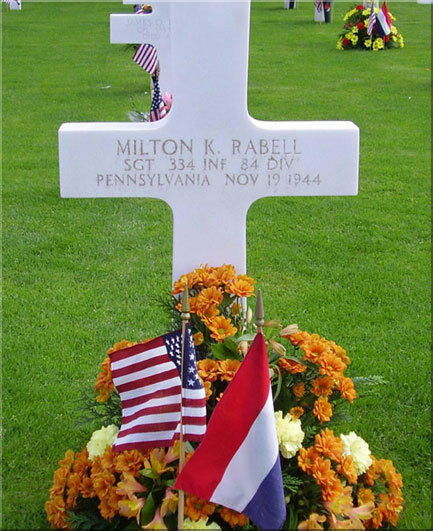 Milton K. Rabell was born at 17 December 1920 in Cambridge Springs, Pennsylvania. The Rabell family counted father Rabell , the mother, three sons and one daughter. 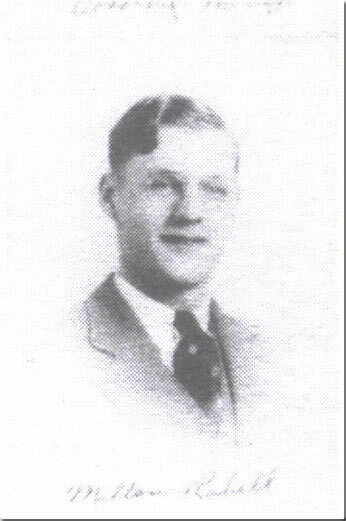 After graduation from Cambridge Springs HighSchool, Milton married his youthful passion Edith Campbell. 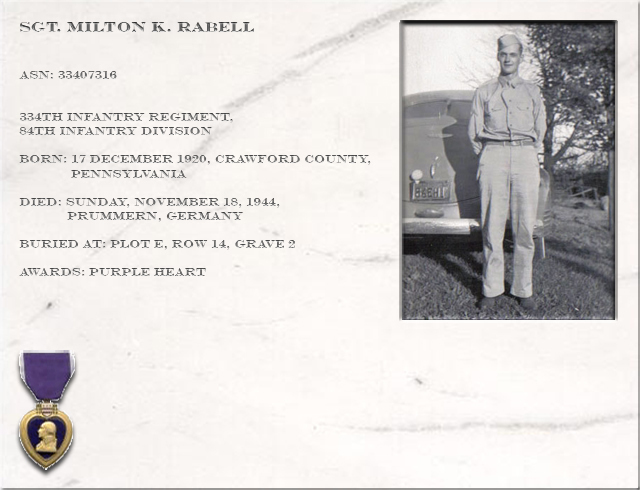 At the fifth of December 1942 Milton Rabell enlisted in the Army at Erie, Pennsylvania, soon to be designated to the 84th Infantry Division, or as it's nickname was used : the Railsplitters Division. THEN known as the Lincoln Division, the 84th had landed at Cherbourg and Le Havre in World War I, eager for action against the Kaiser's armies. Most of the 1918 Railsplitters got their chance at combat but not as a unit. 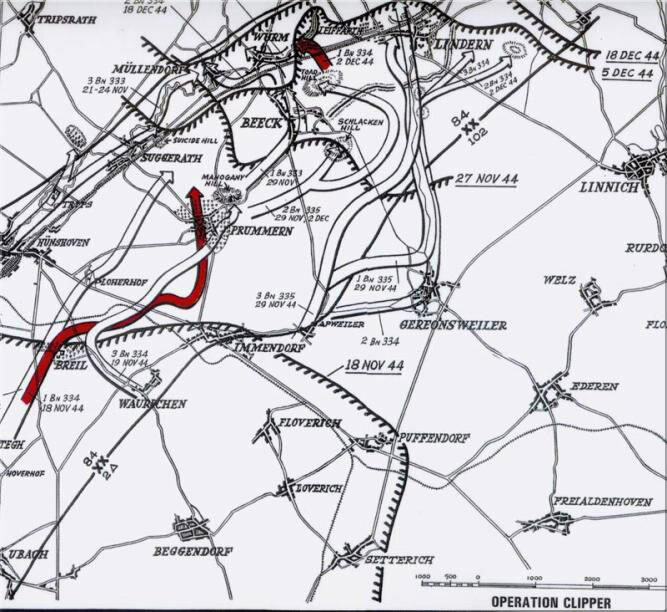 The Meuse-Argonne offensive and an epidemic of influenza had created a vast manpower shortage, and the 84th, like many other divisions, was used as a reinforcement pool. The new 84th was activated Oct. 15, 1942, at Camp Howze, Tex., about 60 miles north of Dallas. Then, as now, it was composed of the 333rd, 334th and 335th Inf. Regts. ; 325th, 326th, 327th and 909th FA Bns. ; 309th Engr. Combat Bn. ; 309th Med, Bn. ; 84th Sig. Co.; 784th Ord. Light Maintenance Co.; 84th QM Co.; 84th Recon Troop. Basic training for the division's 16,000 men began Jan. 4, 1943. It was cold on the wind-swept plains of north Texas, sharp foretaste of what was to come two years later in the Ardennes. From Camp Howze, the 84th went to the Louisiana Maneuver Area for eight weeks of large scale war games beginning Sept. 19, 1943. So-called "free maneuvers," combining the operations of infantry, artillery, tank destroyers and other branches, climaxed the training. With all phases of their training complete, Railsplitters left Camp Claiborne in September for their staging area, Camp Kilmer, N.J. By Oct. 1, they were in England. Their headquarters at Winchester, Railsplitters remained in England for a month. Mines and military police schools were conducted, The division supplied personnel necessary for ten provisional Quartermaster truck companies formed to assist in the operation of the famed Red Ball Express, shuttling supplies to fighting fronts. Wasting little time, doughs sped through France and Belgium into the Netherlands. Rarely had a division been moved from the States to the flaming Western Front with such speed as the 84th's. Within a week after the division CP was set up, Railsplitters were attacking one of the strongest sectors of the Siegfried Line. For some time, Allies and Germans had been swapping punches along the northern sector of the Siegfried Line with neither side able to land a solid blow. Jutting out into Allied lines the enemy salient at Geilenkirchen, a mining and transportation center with a population of 20,000. Germans were just as determined to hold the city as the Allies were to take it, and they prepared for a fight to the death. Pillboxes, fire trenches, mine fields, tank ditches, dragon's teeth and concrete shelters studded the area around this anchor of the Siegfried Line. Joes of the 84th, untried in combat but anxious to see how they stacked up against the vaunted Wehrmacht, were given the job of breaking the stalemate. For men whose combat experience had been limited to mock skirmishes in Louisiana swamps, it was a large order. Loaned to the Second British Army for the operation, the 84th hit the Siegfried with two of its regiments, the 333rd and 334th, and attached Sherwood Yeoman Rangers. Its 335th was working, with the 30th Inf. Div. To the 334th Inf. went the distinction of being the first 84th unit to seize the initiative in the Geilenkirchen sector. It jumped off at 0700 Nov. 18 to take Prummern. Subsequent thunderous action demonstrated the division's offensive spirit. When their tank support bogged down in mud, 334th doughs, guns blazing under a pale November sun, poured through two gaps in an enemy mine field near Breil, knocked out pillboxes to their right, cut the road between Geilenkirchen and Immendorf, then charged into Prummern. By evening, the 334th had moved through Prummern and occupied high ground before Geilenkirchen. Germans scratched 450 more names from their company rosters. Three hundred and thirty German fighting men huddled behind barbed wire in the 334th PW cage. Fighting raged through the night in heavy-defended Prummern. From this knock-down, drag-out fight emerged the 84th's first heroes of World War II. 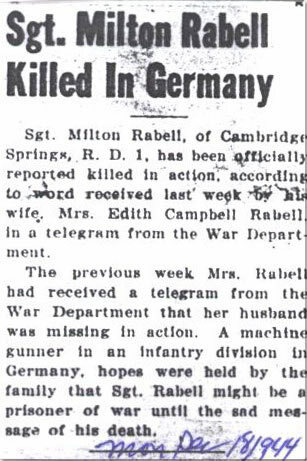 In these fights around Prummern Milton Rabell was fatally wounded, and being taken to a nearby field hospital he succumbed to his wounds shortly after, at the age of 23. For a while, at Cambridge Springs it was unclear as to what had happened to Milton K. Rabell was, but eventually the next of kin received the sad message that Milton had died. 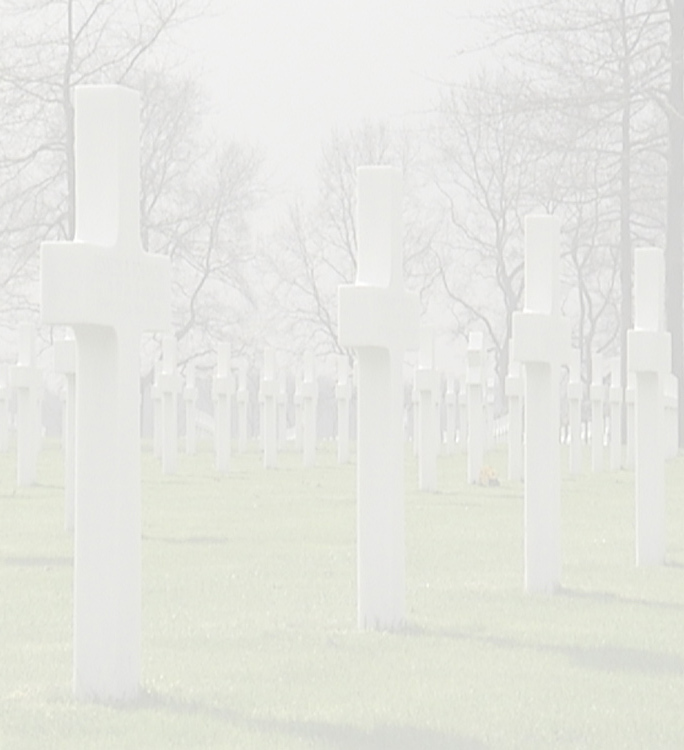 It was his father's wish that his beloved son had to find his final resting place at the military cemetery at Margraten in the Netherlands. Every year at Memorial Day Milton's relatives see to it that a flower arrangement is placed at his grave, far away from his homeland.